Orved S.p.A. is a leading company in the design, manufacturing and distribution of state-of-the-art, high-quality vacuum packing machines that are entirely Made in Italy. The company has been offering for many years a line of external vacuum packing machines, a vast range of vacuum chamber packing machines, trays thermosealing machines, vacuum bags, as well as sous-vide accessories and systems. Orved’s products stand out for their very high quality levels and cutting-edge technological solutions. The reliability and robustness of its machines have been recognized and confirmed by a thirty-year presence in world markets. Each and every one of Orved’s machine complies with the strictest international standards and is CE-ETL-ETL Sanitation certified. Orved’s entire internal quality management system, both of its packing machines as well as of its vacuum bags, is ISO 9001:2008 certified. All of its machines enjoy warranties combined with a fast and professional assistance, which is also ensured at an international level. Innovation is one of the most important value that distinguishes the company from the others present in the vacuum packing sector. 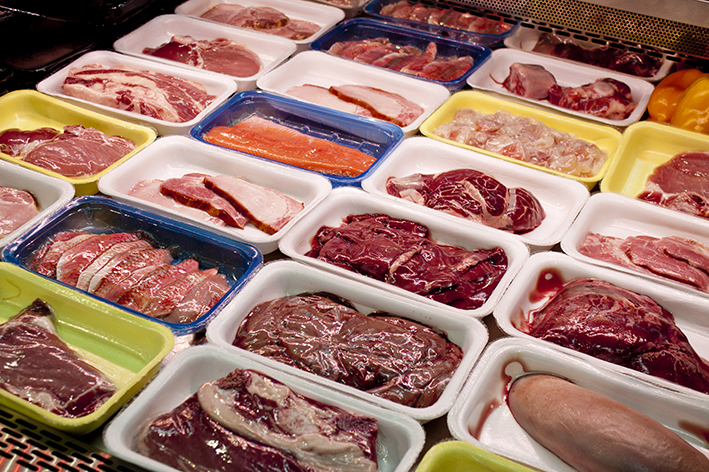 Recently Orved has designed and developed the first vacuum packing machine able to vacuum pack products for the space. Orved is proud to have designed “Orved Argovac”, the packing machine that vacuum packs foodstuffs for astronauts. This machine was also used for vacuum packing foods sent into space for the “Futura Mission”, to which, among others, the Italian astronaut Samantha Cristoforetti took part. Orved, for this mission, produced both the Orved Argovac vacuum packer as well as the special vacuum bags suitable for the packaging of the astronauts’ food. For 2016 Orved has developed a lot of product innovations that cast new light on the preservation, sealing and cooking field. The latest product is the new Bright Line characterized by a refined and innovative design, stainless steel bodywork and an exclusive Wi-Fi device present within the machine. The Wi-Fi allows the vacuum packing machine to communicate directly with the user. Thanks to the Wi-Fi technology the user can benefit of many advantages such as: remote programming by means of Pc, Tablet and Smartphone – fast technical assistance – automatic update of the machine software and analysis of all machine functions. The new Bright line has been enriched with two new vacuum packing machines: Cuisson 31 and Cuisson 41. These two brand new machines represent the real innovation in the vacuum packing of liquid products thanks to the patented vertical chamber and the 9 deaeration programs and 11 preset programs, such as sauces, cream, ice-cream bases and pastry bases. These new programs make the vacuum packing of liquid products easier than ever and all people can be able to vacuum pack products even without the Chef supervision, thanks to the automatism of the programs. Orved is well known for satisfying all people’s needs, even the most difficult. 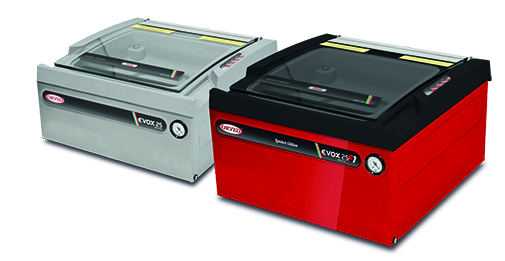 Evox 25 is the new challenge that Orved has won with its new machine, Evox, the smallest vacuum packing machine with maximum vacuum performance. Fit for any space even in the smallest kitchen, Evox 25 is ideal for small restaurants, delicatessens, bars and all small shops. Orved is once again pleased to present an end result of absolute excellence and it is proud to launch in the market both the Evox 25 stainless steel built and its limited edition Evox 25 F1, characterized by an exclusive red colour. Evox 25 F1 is the ideal vacuum packing machine for all those people looking for a fast machine yet with a distinguishing avant-garde design. In the thermosealing field, Orved presents a new trays thermosealing machine, VGP 60n Skin. Vgp 60n Skin, is the new machine which renovates the concept of vacuum packing and sealing thanks to its exclusive “Skin Effect”: a particular system of vacuum packaging which enables a specific film fit for food contact to perfectly adhere to the product like a “second skin”. With VGP 60n Skin any product can be packed and their freshness, quality and above all aesthetic aspect better preserved. Nowadays Orved is growing day by day and has increased its presence in the world in 121 countries with 1248 dealers and importers. Orved – Constant Professionalism and Innovation! Orved’s innovative sous-vide cooking system: products cooked slowly but with unmatched flavour and taste!